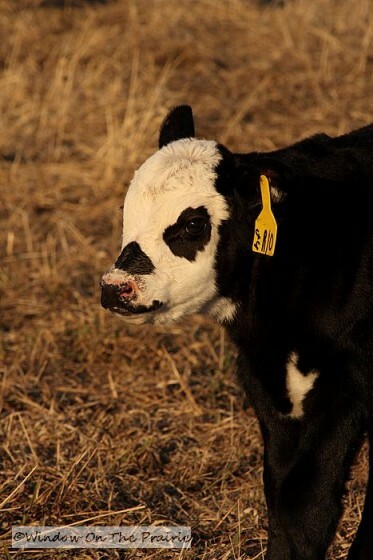 Yesterday was the 1 week birthday of this little white-faced calf, so I went out into the pasture to pay him a visit. He repaid the favor by coming up to me. Here’s his Mama. He just loves her. He ran up to her and pushed his head against her chin. 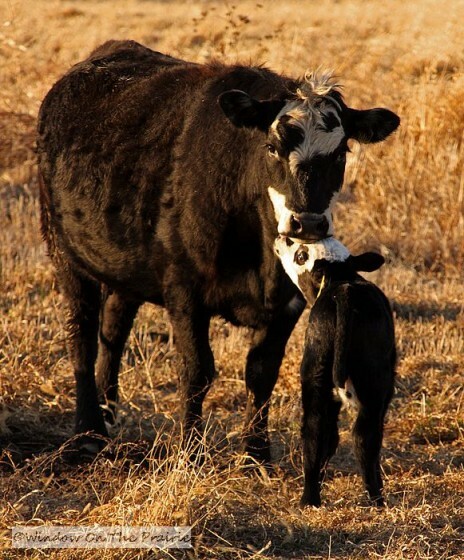 I like to think it’s a calf’s version of a hug. 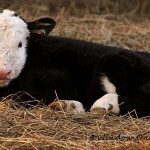 Most calves in the first couple weeks are fearless. If I go out into the pasture and crouch down to their level, curiosity forces them to come over for a closer look at the human. They just can’t help themselves. Their mamas call to them from afar trying to warn them of the dangers of approaching those shifty humans, but all their warnings fall on large deaf ears. 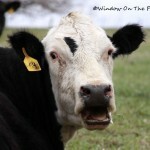 That coughing sound when the calf was sniffing me was not the calf, it was a heifer out of camera range off to my right. She has atrocious manners. 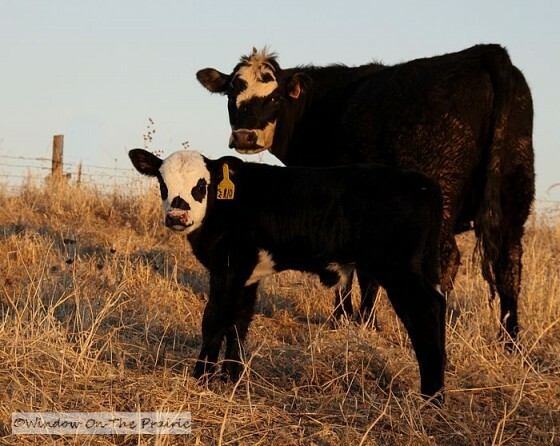 Did you notice how the calf’s mama called to him with her loudest MOOO and he completely ignored her? What’s a mother to do? Later, then he added insult to injury by running laps around her just out of reach. 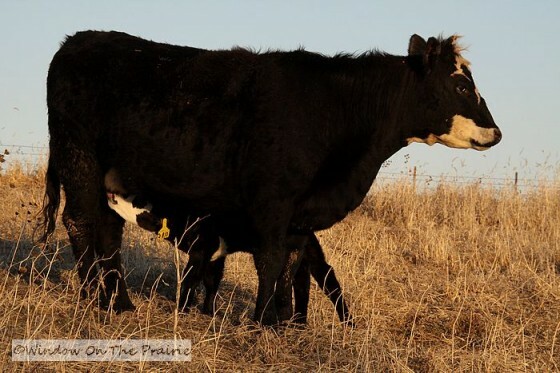 Did you see the other cow charge the calf when he got too close? Even she was not happy with his antics. 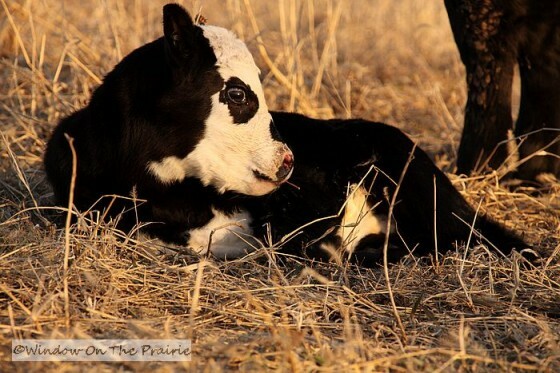 But a calf has to run and play, it’s so much fun. 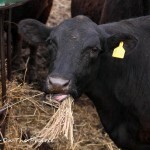 Later he decided to be a good little calf and eat his supper. 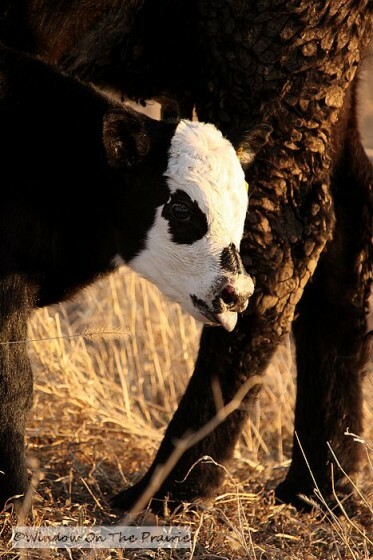 When calves nurse, they stick out their tongue and when done eating, very young calves forget to put it back into their mouth. Then it was time for a rest under mama’s watchful eye. 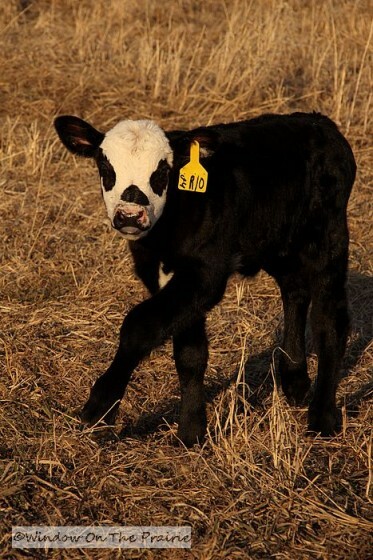 See ya later little calf. 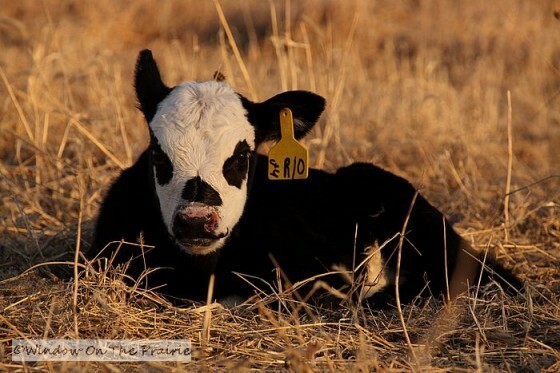 He has the cutest markings and I would name him Panda! 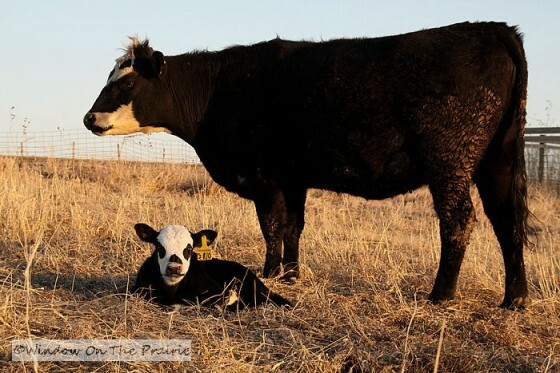 That mama cow gave you a long hard stare when her baby came back. He’s a cute little guy. Aw, – he looks like a little panda bear! Love the picture of him giving his Mom a “hug”! I thought his markings looked familiar. That’s what he looks like, a panda bear! Duh on my part. Thanks Dianna. So cute. 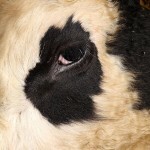 I would have to keep this one and not sell him at auction next year. That was so cool. Thank U for the entertainment. Can’t wait for more. Well that was fun. What a cutie. What I really enjoyed about the videos was the absolute silence except for the sounds of the cows. I really miss the country. Thanks for sharing! While I grew up in the country, Monica, I didn’t realize until I moved and lived in town for a few years how much I enjoyed the country quiet. Now that I’m back in the country, I try not to take it for granted. Oh my goodness, how adorable! I never thought the a little calf could run that fast! I like how the mamma watches her go back and forth…that is awesome! I loved how he came right up to you. 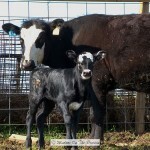 Just love the calves! They are such sweet babies. That was fun. Thanks for sharing a little nature with this city gal. It brought back memories of living out in the country for 5 years where we lived next to a cattle ranch. It was always fun to see the young ‘uns play – what I fondly called “cavorting.” What fun! What a cutie! I love the photos, and enjoyed the videos. When I was a girl, and we visited my dad’s uncles’ farm in Iowa, I used to go sing to the cows.